Summary: The CT300 Elliptical from JLL is what I’d call ‘budget+’. Sure, you can find (slightly!) cheaper machines. What you would be compromising on is size, build quality and reputation. JLL build a lot of different machines – they are especially well known for exercise bikes. With solid feedback, a long feature list and that JLL service, I’m sure that the feedback from buyers on the CT300 cross trainer will continue to be positive. You’ll get a silver and grey cross trainer which measures 120cm x 61cm x 167cm. The height is standard across many models (those poles can’t be too short, or only small people could use them). It’s the length which makes the biggest difference. In a commercial gym, ellipticals are big (think 180cm to 2 meters). Budget models are tiny – some only 1 meter long. At 1.2cm the JLL CT300 is a little bigger than many budget models, though not huge. There are wheels for moving it around by the way! It weighs 35.9kgs – again, a little more solid than many rivals. Max user weight is advised at 100kgs. Some assembly is required. Every piece of equipment that needs even a tiny bit of assembly gets people ‘crying’ in the comments. This Elliptical is no exception, though most people said 30 mins to 1 hour and easy to do. This model comes with a 5.5kg flywheel. It combines magnetic and belt resistance, which does help keep things quiet and smooth. You’ll need to change the resistance manually by twisting a dial. This is no different to any lower-priced elliptical. You can peddle both forwards and backwards and have the choice of using the moving poles or holding the stationary handlebars. You can see a zoomed-in picture of the console over on the amazon.co.uk product page. There are no pre-set programs for this model, though the controls are simple to use via the buttons underneath the console. In a big improvement over previous models, there is a tablet holder available. Perfect for watching TV or listening to music while you exercise. Overall people were very happy with this cross trainer. The word which appeared multiple times (I always check for this!) was ‘value’. As usual, lets look at the negative reviews. One buyer complained that it was not as good as a cross-trainer he used to own that costs more than twice as much…. Go figure that one! Some people were grumpy about having to assemble things (standard!). One other lady was working out the source of a ‘clank’ after 18 months… this is still being resolved by JLL (one-star review was left of course… I guess she expected the pope to visit the very same day, bless her elliptical and have the clank disappear via divine intervention!). Positives are the overwhelming, mostly short and generally say that the CT300 is indeed a basic home elliptical trainer – though is great value for money. Make sure you check the latest feedback for yourself, this is always entertaining as well as informative. Wrapping Up: How Does the JLL CT300 Compare to Other Budget Home Ellipticals? You’ll get a solid elliptical, bigger than most of the budget range models, for a competitive price. 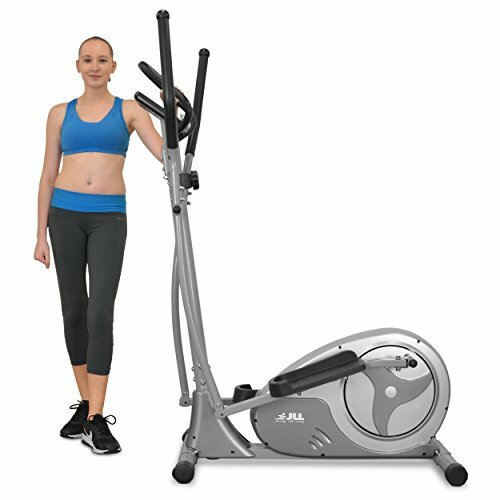 JLL have a great reputation for making quiet, smooth fitness equipment that won’t break the bank. No, this won’t compare with the kind of ellipticals you find in the gym. You’ll need to spend around 5x the price of the CT300 to get close to that. For those wanting a reliable way to work out with a decent console and variable resistance, the JLL CT300 ticks all the right boxes. Check out the latest price for yourself (along with that entertaining feedback) on this dedicated amazon.co.uk product page now!